A recent ATLAS measurement extends searches for new bosons up to masses about 70 times the mass of the Z boson. The search examines events where the postulated boson (X) would decay into an energetic photon plus a W or Z boson. ATLAS is well suited for detecting such events, initially selecting an energetic photon and subsequently identifying highly-boosted W/Z bosons from their decays to quark-antiquark pairs. The mass of the X boson can be obtained directly from the decay products and evidence for the X boson would appear as an excess of events above background. Alas, no such excess is observed, allowing improved limits to be set on the production of an X boson in the mass range from 1.0 to 6.7 TeV. 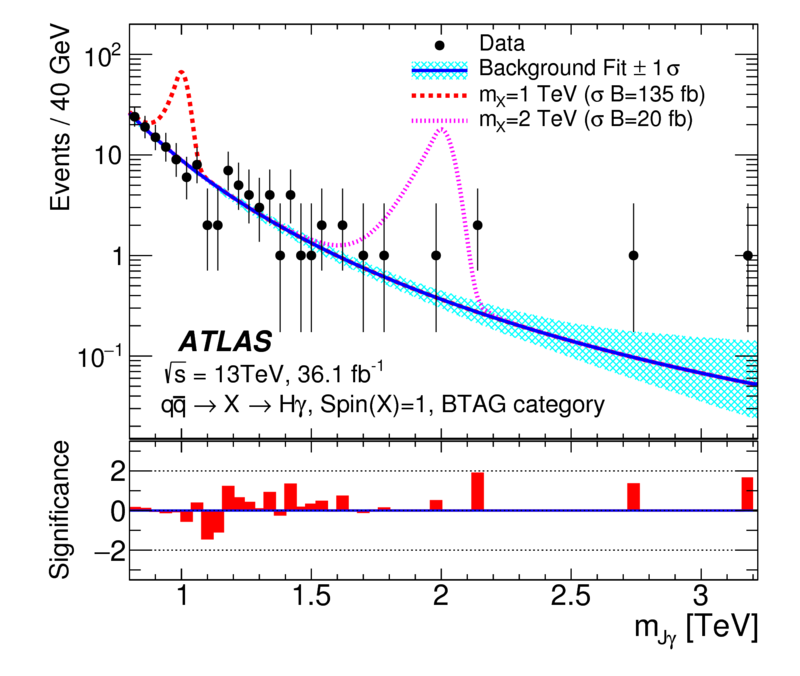 Since all-things-Higgs are of particular interest these days at the LHC, the ATLAS measurement also carries out the first search for a massive new boson decaying to a Higgs boson plus a photon. This signal is identified using decays of Higgs bosons with the largest branching ratio, namely a pair of b quarks. As shown in the figure, the observed invariant mass distribution of the events selected as a Higgs boson plus photon is a smoothly falling spectrum, showing no evidence for a new boson. The plot shows a computer simulation of what would be expected for X signals with masses of 1.0 and 2.0 TeV. This is the first search carried out at the LHC for a massive boson X decaying to a Higgs boson plus a photon, and is sensitive to these bosons with masses up to about 25 times the mass of the Higgs boson. Although this current ATLAS study finds no evidence for new forces, the range and sensitivity of the search will be significantly improved when including data collected by the end of 2018. Look forward to results using the full LHC Run 2 dataset.